When Henrik “HP” Pettersson finds a mobile phone on the train his first thought is how much it might fetch if he tried to sell it. The phone receives a message, addressing HP by name, and he starts to look around for the hidden cameras. He has been invited to play a “Game” – he will be assigned tasks, and receive point and cash prizes for each task he completes. The tasks seem easy – steal the umbrella from a fellow train passenger, spray graffiti on an apartment door – and the pay-out out of proportion with effort he’s expending. But when one of his tasks draws his sister – a police protection officer – into the Game, HP soon discovers that the stakes are a lot higher than he first thought, and quitting isn’t as easy as he imagined. Anders de la Motte’s debut novel, the first in a trilogy, takes no time at all in getting to the heart of the story. By the end of chapter one, HP has found the state-of-the-art phone – the number 128 on the back the only marking – and been invited to take part in the Game. Within this short period of time we learn a lot about HP – he’s a dropout, a petty hoodlum, a man in his thirties who goes through life with the attitude of a teenager who believes the world owes him a living – and we discover the Game, and the few rules that govern it, along with the novice player. In parallel, we meet Rebecca Normén, a police protection officer – a bodyguard to Stockholm’s political elite – a young woman struggling to make a name for herself in a male-dominated profession. Her job, and the vagaries of the Game, put her on a direct collision course with HP, a man with whom she is already intimately acquainted. 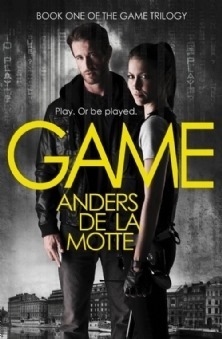 Game is fast-paced and action-packed, rarely taking time to pause, or allow the reader time to breathe. In HP, de la Motte presents a thorough unlikeable protagonist, but one who the reader is willing to follow through the course of the book, because his fate is always so uncertain, and the Game itself is so intriguing. The concept of the leader board – allegedly created specifically for HP – and the online videos appeal to the reader as much as to the player, making the whole scenario entirely plausible. Based purely on technology that is available now, and concepts with which we’re all familiar – that sense that Big Brother is always watching, or if not Big Brother then somebody with a video-capable mobile phone – we’re plunged into a realistic and dangerous situation along with HP. Rule 1: Never talk to anyone outside the Game Community about the Game. and, in one breath-taking set-piece, a thrilling homage to one of Hitchcock’s finest moments: the crop-duster scene from North-By-Northwest. De la Motte shows promise for a first-time novelist. Throughout Game, we see an author in complete control of his work; in a number of well-written and perfectly-timed sequences, he manages to pull the wool over our eyes so that, despite the omniscient narrator, we’re on equal footing with HP and Normén: we never know more than they do, never more than we need to and, in some cases, we’ll finish a chapter only to discover that they know more than we do, due to some sleight of hand on the part of the author that leads us, momentarily, down the wrong path and shatters any illusions we might have that we can think this one through to the end. The beautiful city of Stockholm plays a key role in the story, its island-based geography and many interlinking bridges providing HP the means he needs to escape from the scenes of his crimes, while not requiring much from the reader in the way of suspension of disbelief. Like Jens Lapidus’ Easy Money before it, Game shows a side of the city rarely seen from the outside. Razor-sharp characterisation and non-stop action combine to make Game stand out from the glut of Scandi-crime novels currently on shelves. Anders de la Motte is a writer of no little skill, and his perfect pacing and careful rationing of the facts ensure that not only the ending, but the very next scene, will come as a complete surprise – if not outright shock – to the reader. It’s been some time since I was this impressed by the construction of a crime novel and, on the strength of this first offering, I’ll be diving into Buzz and Bubble (the second and third parts of the trilogy) as soon as they’re available. Not to be missed. Check out the video below for a taster of what to expect.